Image courtesy Merck & Co., Inc.
Isentress (ratelgravir) is an integrase inhibitor-class antiretroviral drug used in the treatment of HIV infection. Isentress was the first integrase inhibitor to be granted approval by the U.S. Food and Drug Administration (FDA). In October 2007, it was licensed for use in adults who had resistance to other antiretroviral drugs. But by July 2009, and later in December 2011, the FDA expanded its indication, allowing for use in all adults with HIV, as well as children ages 2-18. 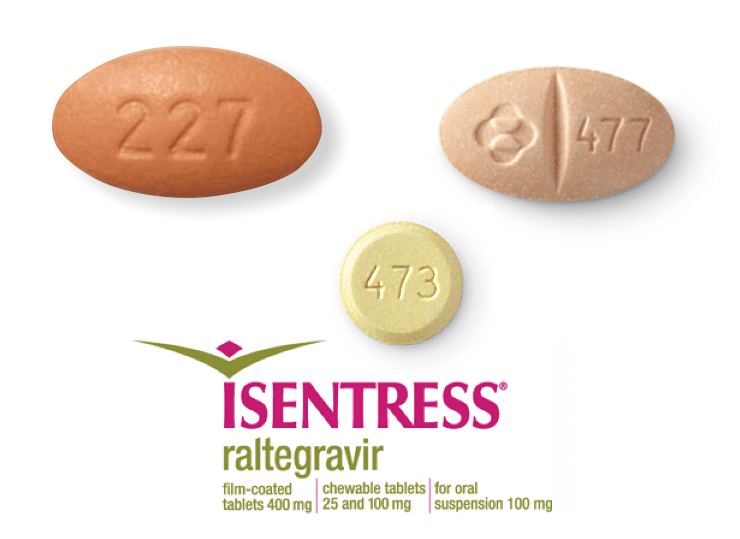 Isentress is among the drugs currently recommended as preferred first-line options for HIV therapy in the U.S.
For adults and older children, Isentress is available as a 400mg film-coated tablet, oval in shape and pink-orange in color. The number "207" is embossed on one side. For children unable to take tablets, Isentress is available as either a 100mg chewable (oval, beige, embossed on one side with "477," scored for splitting) or a 25mg chewable (pale yellow, round, embossed on one side with "473"). Both are orange-banana flavored. For smaller children unable to take chewables, Isentress is available in a single-pack, 100mg oral suspension. The oral suspension is mixed with 5mL of water and administered with an oral syringe. Once mixed, the oral preparation should be used within 30 minutes, with any leftover immediately discarded. The suspension is banana flavored. Never substitute Isentress chewables or oral suspension for Isentress film-coated tablets as the formulations are not bioequivalent. Use only as directed (see Dosages below). Isentress may be taken with or without food. Isentress cannot be taken on its own and must be prescribed as part of combination antiretroviral therapy (cART). Patients who experience an allergic reaction after starting Isentress should contact their doctor immediately. Treatment should be stopped and medical treatment sought if a rash is accompanied by fever, muscle or joint pains, blisters or sores, redness or swelling of the eyes, swelling of the face or mouth, or breathing problems. Patients who have previously experienced a hypersensitive reaction to Isentress should not be re-challenged with the drug after resolution of symptoms. Animal studies have shown no embryotic or fetal birth defects during pregnancy in mice or rabbits exposed to Isentress. However, the impact of Isentress on breastfed infants has not yet been established, and, as a result, breastfeeding is not recommended for mothers taking Isentress. FDA. "FDA Expands Use of HIV Drug Isentress to Children and Adolescents." Silver Spring, Maryland; December 21, 2011. Reuters. "UPDATE 2-FDA OKs Widened Use of Merck's Isentress HIV Drug." July 9, 2009. U.S. Food and Drug Administration (FDA). "Drug Approval Package – Drug Name: Isentress (ratelgravir) 400mg Tablets." Silver Spring, Maryland; October 12, 2007.